Colombo - Sri Lanka's Test captain Dimuth Karunaratne apologised on Monday for his "unbecoming behaviour" after being arrested for drunk-driving in an accident that left a taxi driver injured. Karunaratne, 30, was taken before a magistrate who suspended his driving licence and fixed a trial for May 2. The Sri Lankan was also asked to take a medical test. Police told the court that while driving under the influence of liquor, Karunaratne went through a red light and hit a taxi whose driver was hospitalised for minor injuries after the pre-dawn crash on Sunday. "My actions were utterly unbecoming of a Sri Lankan national cricketer and I do apologise to all of you for this incident," Karunaratne said in a statement. The incident came as Sri Lanka decides who will be captain for the national team at the World Cup starting in England on May 30. 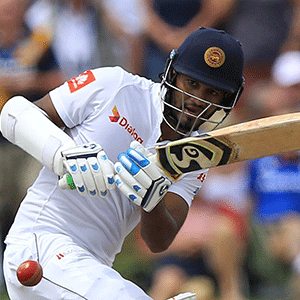 Sri Lanka's cricket board said in a statement it would investigate the incident "in order to take necessary action."